Antique metal signs are a fun collectible that adds a certain nostalgic charm to any environment in which they are displayed. During the 1960s, metal signage fell out of favor. Many of the signs were thrown away and replaced with paper signs. Others were left hanging but were allowed to deteriorate. Forty years ago you could have picked up an antique metal sign for pennies, however the market has changed and these old advertisements are valued by collectors as an art form. Some of the signs fetch thousands of dollars at auctions. Finding affordable metal signs is more difficult than ever. Not only are there fewer on the market but it can be difficult to tell the difference between the authentic antique signs and the reproductions that have flooded stores in the past twenty years. These old tin signs can often be found in antique shops, especially those in smaller towns. You can expect to pay $200.00 or more for a small sign and considerably more for the larger ones. If you see an inexpensive metal sign, you shouldn't assume that it is a good deal. It could easily be a reproduction. You may find authentic vintage signs at flea markets for less than in antique stores but you will want to be especially careful. Often the seller doesn't know that much about the sign such as whether it is genuine or not. 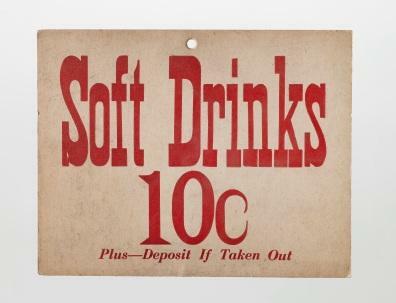 As you travel down country back roads, you may see a few of these signs still hanging in gas stations, cafes, small groceries, or even feed stores. Often they are there just because no one has ever taken them down. It doesn't hurt to ask if the owner would be interested in selling a sign that you like. You never know what might happen. You can find thousands of different signs on the Internet but it can be difficult to tell whether the signs are authentic or reproduction. You will want to ask plenty of questions, check the return policy, and check the seller's feedback if it is available. If a sign is considerably less expensive than other signs it is a good bet that it is a reproduction. There are usually two reasons that people collect old signage. They are interested in collecting for the pleasure of having a collection or they want the signs to decorate their home, office or store. There are many ways that people collect signs. They may collect a certain subject, such as vintage automobile advertising. They may collect a certain brand such as Royal Crown Cola, or they may just pick up whatever catches their eye. There is no right or wrong way to collect metal signs as long as you keep your space and budget in mind. Old signs might look out of place in a room decorated in high Victorian style but they are perfect for a room with a casual, country air. Advertising signs usually look best in kitchens, game rooms, and dens. You may even want to keep the subject of the sign in keeping with the purpose of the room such as using old beer advertising for game rooms, for example. Certain types of signs are more valuable to collectors than other types. While a Texaco sign might be collectible, a sign that states, "Jones Texaco - Dallas's Finest" would be worth more to most collectors since it is unique. The most valuable signs are those that are naturally in good condition. While a little fading or rust will not bother a collector, huge areas of rust, holes, creasing, and severe fading will lower the value. Wipe a sign gently with a soft cloth but don't try to clean the rust off of it. Signs of age, as long as they aren't too serious, are acceptable. Antique metal signs are a reminder of the way that things used to be, the brands people were familiar with, and the design styles that were popular from color to font. Collecting them is a great way to preserve this increasingly rare art form.